Review: Most people know The Offspring because of their big hit singles such as "Come Out and Play", "Pretty Fly (for a White Guy)", "Hit That" and others. The sad fact is, their music has been on a slow but steady decline in quality since 1996 when they released Ixnay on the Hombre. Sure, they still have some good tunes here 'n there, and I doubt it'll ever get to the point where I'd be unwilling to give their latest release a shot, but there's an audible hollowness to their sound now and I'm unable to ignore it. In all honesty though, I think this is because of their first release on Epitaph records - Ignition. I will forever compare anything The Offspring release to this older masterpiece. As catchy as Smash was, it was Ignition that really impressed the hell out of me. The variety of fast 'n angry tunes is great, and they're all catchy as hell as you would expect, but the album has a much edgier feel than any of their latter releases. What would be really surprising to somebody who's only heard their radio hits is just how well written Ignition actually is. From their more serious tunes such as "LAPD", which aggressively protests everybody's favorite police force, to the more reserved melancholic ones about personal struggles, there are many layers to this album and they all blend together nicely. A lot of people find the band to be a bit grating and annoying these days, and while this is something I can understand to an extent, I highly suggest checking out Ignition. Just one listen to an amazing song like "Dirty Magic" will have you wondering how this is even the same band that you're hearing these days. Here's hoping they can somehow find the drive to produce this kind of sound again in the future. While I doubt it will ever happen, if they do manage to pull it off, I'll be among the first in line to check it out. Until then, I'll continue to listen to this often overlooked punk masterpiece. I agree that Ixnay was their last good album. I'll have to search out Ignition, since I've never heard it. Also agree Ixnay was their last good one. Glad people agree with me. 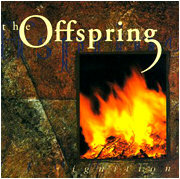 The only Offspring album I have is their "Greatest Hits" one, y'know, with all the known singles and stuff. I like it a lot. Should I get this? I ended up with a few of their albums over time inadvertantly. I bought smash when I was younger but Americana some one left in my car one night and their latest one I got because it was in the CD player of a moving van I rented (I think that this was actually a ploy that the members of Offspring came up with the spread their music). I like them. I can only take them in small doses here and there anymore. I've never heard this one but I'm sure its worth checking out or downloading for like $7.99. Want a good punk band with amazing poetic/heartfelt lyrics that is overlooked all the damn time? Check out Lagwagon. Especially their albums "Hoss", "Double Plaidnum" and "Let's talk about feelings". Offspring is okay but Lagwagon is the friggin' best yo! Oh and if you enjoy Lagwagon once you have checked them out Joey Cape, the singer of Lagwagon has put out a split e.p. and a full album of accoustic songs. Quite a few are Lagwagon songs slowed down and performed accoustic style... very good stuff amigo's. I dunno, I never liked the Offspring, but whenever I hear "Come Out and Play" it becomes lodged into my brain for days. Seriously....[i]days. [i] It's like a form of Hell, I'm sure. Americana is one of my all time favorite album's ever. I like The Offspring's evolution in sound, and admittedly they have some crappy pop songs, but theyre still a pretty good band. At least they care about their fans. Session is the perfect kick off song for this album too. Ixnay is one of the albums that I love because it was the soundtrack to a certain time in my life. Leave It Behind and Amazed are real fantastic songs. For my money, Conspiracy of One was their last great album.